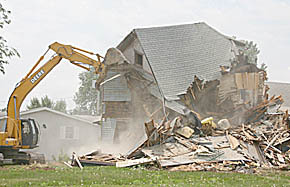 A vacant house at Seventh and Marengo Streets in Albion was demolished Tuesday afternoon, July 5, by Bygland Dirt Contracting. The house is being razed to make way for a new affordable home to be built on the property. Albion Economic Development Corp. (AEDC), the property owner, will contract to have the new home built and offer it for sale once completed. This is one of AEDC’s planned projects for the year.